The Danish toy maker is working toward using corn and wheat as an alternative to petroleum-based plastic. As more companies work on developing plastic from proteins of renewable sources rather than petroleum, some plastic users are stating their hopes for using these materials. Of course, they don’t expect this to happen quickly; more like in the 2020’s sometime. But they are putting their money where their mouths are right now with a $150 million investment in a new center of research, development and implementation — the LEGO® Sustainable Materials Center. They will also hire a hundred materials specialists to work on this major challenge. The Wall Street Journal reports that one of the largest issues will be the volume of plant-based materials for production. At this point, biomaterials companies don’t see the demand to invest in plants and machinery without buyers. LEGO® will need to build demand with other plastic users such as IKEA, Unilever, and Nike to create demand for the new more sustainable plastic materials. These bio-sustainable plastics companies are creating high profile investors. Microsoft’s Bill Gates recently invested in Renmatix, Inc., a company working on Plantrose® technology. Many of these companies are developing plastics that are disposable, therefore have a higher chance of going into landfills. The products available today tend to fall into the category of “bio-compostable” which generally means that the plastic needs other elements in the compost to break down the plastic into natural materials. Problems still exist in these processes, but much progress has been made. 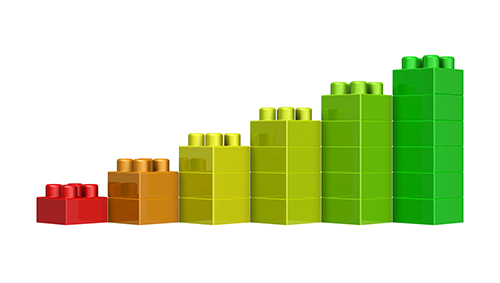 LEGO® finds that their current plastics don’t perform like the existing blocks. They lack consistent tolerances, colors and shininess so far. They also have concerns about them lasting long enough to get decades of performance, “A key part of the LEGO® experience is that it lasts so long,” states Tim Brooks V.P. of sustainability. Consumers seem to be very concerned about disposable plastic rather than products that are used long-term. LEGO® blocks are kept for generations, trapping carbon in the blocks for decades. Yet LEGO® deserves credit for its new initiatives which may bring more publicity to the issue than make a difference environmentally. However, if it can find new bio-materials that solve problems with plant based blocks now, other companies will likely join the movement. In March of 2018 Lego A/S announced they have in-fat started using sugar cane-based polyethylene for a small part of there line of building blocks. Ironically, or perhaps not, the first to get the new sugar cane based resin will be their line of botanical elements such as trees, bushes and leaves! This new initiative will replace just 1% to 2% of there current resin usage. But the company says it is the “sharp tip of a wedge” that will ultimately replace more than 9 million pounds of ABS petroleum based resin per year. This initiative will certainly lead to a public win as consumers learn about the more sustainable materials coming on the market and Lego as a leader will bode well for the company image. Braskem SA is the supplier of the bio-based PE. Lego has begun using the Braskem resin in its Billund, Denmark, production plant but it hopes to expand the usage to other global facilities. Microdyne is testing Braskem polymers with clients now for various projects. Microdyne Plastics recognizes the need to transform plastic products through a variety of methods: recycling, reuse, more sustainable materials, such as bio-compostable, and bio-degradable. Our staff is committed to these long-term goals, and will assist customers in the process.